For those of you who are just crazy impatient, yes, the sets are now for sale. You can run straight over to Bento Yum to see them (there are four) and buy them, or you can first read through a fun little primer on Bento sets. So, I bring you...the Top Ten Reasons to Bento! The great thing about Bento boxes is that they force you into proper portion control. Bento boxes are all labeled in ml to let you know how much food they will hold. In fact, you might be surprised at just how tiny some of these boxes really are! 600ml, the recommended size for a woman in her 30's is about 2.5 cups. Doesn't sound like much, does it? Well, more on that in reason #3. That said, there's no reason that you have to go with the exact suggested size. I usually end up around 650 or 700ml because I have some smaller boxes and I combine them. I do have one 600ml box and if I pack it properly, I never cease to be amazed at how satisfied I am when I'm done eating. If you'd like to get some guidance on what size box you should be selecting, the Lunch in a Box blog has a great guide to choosing the right size bento box. What's more tedious than getting up in the morning to spread yet another sandwich with peanut butter and jelly before tossing that, an apple and a bag of chips into a paper bag? How bout doing it every single day? The great thing about packing bentos is that they are far from boring. Tiny little sandwiches cut into fun shapes? Skewers of grape tomatoes, mozzarella balls and leaves of basil? Tiny little empanadas? How could little food in creative packaging be boring? I've found that packing Greg's lunch at the end of the day is actually pretty darn fun. I send him and the kids out of the kitchen and get 20 minutes to myself while I pack lunch, put away leftovers from dinner and load the dishwasher. 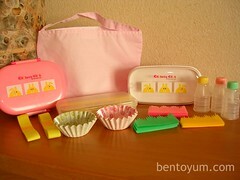 Not only does bento packing limit your meal size, it also comes with guidance on what to put in it. Typically a bento holds 3 parts grain, 1 part protein and 2 parts fruits of veggies. Since you're packing food into a small space and you don't want to be starving after your meal, there's incentive to pack filling healthy food and to leave the empty calorie junk behind. Think of the amount of space a Twinkies takes up. Now picture having the same amount of rice. Which one is going to be more filling and healthier for you? Another goal of Bento is color. Not Red Dye #4 color, but God's colors! A great bento takes advantage of the natural variety of colors that appear in our food and encourages bright colors and healthy food. Think of all the colors you see in fruits and vegetables and how beautiful a great arrangement of them looks. Now think about the fact that if you steam a veggie, it keeps it's color (and is healthy) whereas if you boil it, it loses both color and those essential nutrients. As you start to look at various bento sites (and the Bento Yum blog) for examples of great bentos, you'll notice the common theme of "Wow does that look tasty...and healthy too!" That's not to say that you can't pack treats, but consider shoving a few Hershey Kisses into any little spaces left as you're packing rather than trying to cram an entire Suzy Q in there. Dolly Parton always said that she ate anything her heart desired, but on the "bad stuff" she stopped at one bite. You wouldn't believe how much more food Elnora will eat if it's packing into a teeny tiny Elnora sized bento box. Or if it's cut into fun shapes. In fact, a few days ago I made her a teeny tiny bear shaped cheese sandwich using some of my new cutters. She picked it up and hugged it, then carried it around the kitchen for about 15 minutes before she ate it. Even Greg (an adult in his 30's) finds them wonderfully entertaining. After a few days of bento he confessed that every day he's excited to see what's in his lunch. Not to sound too "little woman" style hokey, but the man loves his bento lunches and calls nearly every day to say how great it was and to say "thanks." It's one of those little things that I can do as a way to say "hey, I love you!" even if everything else in life is so crazy that it doesn't get said that day with words. This is one of the absolute best things about bento in my mind. You see, with the goal being to build a "small bite" meal...a wide variety of small potions of food, you never have to worry about what to do with the two spoonfuls of leftovers. How many times have you thrown three spoonfuls of corn in the compost pile because you didn't want to pack it up for the fridge? How bout the single meatball that you pop in your mouth while cleaning up even though you aren't hungry? Imagine a world where all of those little scraps can come together into a great little smorgasbord of lunch. That's bento my friends! Ok, I'm not one to promote the "keep up with the Jones" attitude, but if you can BE the Jones...well...LOL Seriously though, people are fascinated with these boxes. Just look at the reaction we've had here on the Lactivist. So, you get the fun of being the first of your friends (or your kid being the first of theirs) to show up with the fantastic new bento box packed with yumminess. Greg said that the first day or two, the guys at work teased him about his "fancy" lunches. They still do sometimes, but now he can see that there's some serious jealousy going on there too. Because again, would you rather eat one of those awesome, healthy, tasty bento lunches...or a Big Mac and Fries? Ok, so this isn't so much about bento as it is about supporting Abigail. As you know, I'm a work at home mom myself and my "real job" is helping people market their small businesses online. Abigail falls into this category and is really taking on the entrepreneurial spirit. Let's support her in that! So go buy bentos from Bento Yum and then tell your friends to do the same! 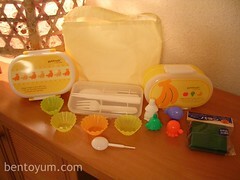 Onigiri...Furikake...furoshiki...egg molds! How about umboshi? Oshibori? Come on, you know you want to throw around $5 words that no one else knows. I have no idea why it works this way but bento has totally driven my need to find new foods to eat. I went hunting for kumquats because they are the size of grape tomatoes and work well for holding things in place. (When you pack your bento, you shouldn't be able to see the bottom of it...use small, bite size things like grape tomatoes, blackberries, kumquats, etc... to "anchor" things in place by shoving them into any cracks.) I also realize that I don't want to pack the same grain every day (rice or pasta) so I've hunted down couscous, quinoa and a few other things just to try. This was the biggie for me. I'm a creative type but sometimes I get bogged down in the day to day. 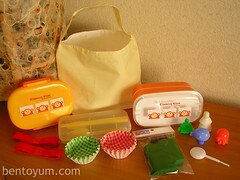 With bento, I often find myself day dreaming about how to place food into the box to give it a natural design. Whether it's fruit in rows, slices of zucchini overlapping each other in a perfect circle around some rice or even just the idea of putting egg salad sandwich on a chick shaped piece of bread...creativity rules the day with bentos. This fruits-luscious banana bento set, full of yellowy brightness, is sure to get some smiles of happiness! The top reads "putifresh lube sheep. Happy fruits is very delicious. I will eat this and will become fortunate all together!" 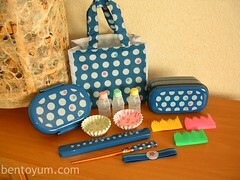 Japanese traditional blue joins modern bento style in this fun and sophisticated complete lunchbox set. A bright and quirky complete lunchbox set with these words: "Clickety Click. My name is Rinda. Favorite food is the white cake and the sweet cherrys. Verry nice." Sounds yummy to me! Wild and adventurous orange, yellow, green, and red monkey bento set with these words: "Clickety Click. My name is Mink. It likes reading the book of an adventure. It is excited very good." Abigail is accepting PayPal and all sets have "Buy it Now" buttons on their full description pages. Can't wait for my Mink Monkey set! Apparently Bento fever is catching on! However, someone raised a point about some of the boxes containing high levels of lead. Do you know anything about the lead levels of the sets you're selling? Since I'm buying them mostly to pack lunches for my son, it would be good to put my mind at ease. As far as I understand it, the bento with lead issues tend to be the with the cheaper laquer boxes and something with the paint, though I could be misunderstanding it. I'll ask Abigail to check. I just ordered my very first set! It was quite the splurge for me, but I figured I deserved something special! I can't WAIT for mine to get here. In fact, I'm so inspired, that I even made Elisabeth a bento-style lunch (lots of variety, lots of color) this afternoon, even if it wasn't packed in a box. LOL, yeah, I'm getting sucked in with her new stuff too. I've got about 9 boxes...well, maybe 10 since I just got a new set last week, but I couldn't resist the new banana putifresh set she just posted. The new one has two double tier boxes and a single tier box, which means there's enough space to pack my lunch, plus Emmitt and Elnora's all in the same set. They have quite good collection of bento accessories. Awe... :( The store site isn't there anymore...I wanted one for x-mas!